been a while since i've done a sports post, so i'm due for one i suppose. let's start with the good: here's some of my highlights from this year's NFL postseason. i realize it's a little late, but i've been really swamped with work, school, masters (had to do a video taped lesson... heinous! as soon as the camera's on, a few of my students decided to go insane! good news, i think i'm thinner on camera than i was at this time last year! may be an illusion, was wearing a black shirt. hmmm.). anyway, so every time i had a thought, or a rant, or a favorite sports moment in the past month instead of posting i've just had to set it aside and focus on other things. time to free my thoughts. release the kraken! i realized that most of my favorite postseason moments this year have been from the NFC teams... odd. well, what else would it have been? matt cassel throwing an interception in the chiefs playoff game? i don't think so. but it's not time for "i'm not ok with that" yet so let's get on with the good stuff. highlight #1: marshawn lynch's amazing td run for the seahawks! i watched this happening live and i was like "oh wow. oh my gosh, he's still going! Oh NO HE DIDN'T! HE JUST PUSHED THAT GUY RIGHT DOWN! OH MY GOSH!!!! WOW!!!! THAT WAS AWESOME!!!" or something like that. the crappy thing about being the sports genius that i am is that i knew immediately this was an amazing moment in sports, but i didn't blog about it immediately, and then within 2 hours it was ALL OVER THE PLACE, and here i am a month later writing about that one awesome thing that happened that one time. great. still worth another look-see if you ask me. highlight #2: this is just one measly example of why i chose to root for the packers during the superbowl... because aaron rodgers is the kind of quarterback that i love to watch... gritty, hard-nosed, takes a tackle head on, and doesn't play "scared" when he has already had 2 concussions this season. i don't know if that's just stupid or if it's the smartest thing ever! when you play scared, you get hurt. so what does rodgers do? dives for a rushing td headfirst against the bears in the NFC championship, that's what! note the mini-weight belt celebration at the end. also, i always enjoy a rushing td where the carrier stretches out over the pylon... it's such smart play to use every inch of the field, the entire width, to stretch the defense. check out how deep he runs for this play to develop before he turns for the end zone. i just think it's brilliant. highlight #3: big fella does a little dance. becomes an instant classic. if this isn't one of my favorite things of all times i don't know what is. no need for explanation, it is what it is...pure awesomeness. i will not show any highlights from the super bowl. i was glad that the packers won, i've been a packers fan since reggie white, which i realize is still pretty recent history, but i was a kid when his career started so it's where my memory of loving the packers begins. you know, for the same reasons that i like how rodgers plays i find it REALLY hard not to like how ben roethlisberger plays too, but he's just not a very likable person. from a pure sports perspective, though, i would still probably prefer rodgers over big ben because he takes his risks on the field and not in life. ok, now on to what i'm not ok with this week and that is bill self. i've always held that, while i will never be able to bring myself to root for ku and the fans drive me insane (except holly, she's just great and completely rational in her fandom and she's about the only person that i'm allowed to watch sports with because she won't judge me when i have to say some words), i've always had great respect for bill self as a coach and a person. well, he has been on a slight downward trend in my heart for the past month with how he has chosen to handle, or not handle, the mario little situation and the hot-headed morris twins. first of all, 4 weeks or so ago mario little was arrested for assaulting 4 people. within a few weeks he was back on the court. not only was he back on the court but his playing time mysteriously seemed to increase! not only this, but last week he was on the court scoring 17 points and being named player of the game against rival MU. well, i am simply dumbfounded. a month ago, when self was questioned about the incident of assault, he was defensive and even slightly disrespectful to the female member of the training staff that was assaulted by mario little, saying she wasn't "part of the team, oh but she was 3 weeks ago, oh but she's busy with classes now so she's not working with the team at this time (semantics, bill! ), oh but there's no proof she was his girlfriend, but, but, but..." i was irritated at the time, but i thought i would just ignore this irritation because people are misunderstood in the press all the time and maybe bill was just still a little stunned by the news that one of his veteran players just assaulted 4 people. so i cut bill a break. but to see little's minutes go up and to see him getting the recognition and the applause from the fans, and the hoopla... ick. just ick. so, in that same game, the mizzou game, markieff morris had a flagrant foul for a -not-really-a-punch-kind-of-a-shove directed at the face of an MU player. the broadcasters thought he maybe should have been ejected, i don't know, could go either way. i thought at the very least that he should not have gone back in the game, yet he did. what's more, self didn't even seem to have a problem with morris' dirty play. he didn't yell, didn't glare, didn't seem even all that frustrated that one of his star players almost got ejected and got an unnecessary foul called against him. no, self did not even say a word to markieff about it. not only was it just plain bad sportsmanship on markieff's part, but it's also extremely selfish and completely without regard for his own team! as one of the best players, in a rivalry game that was still a game at the time, you can't afford to risk being ejected! you can't afford to risk sitting the rest of the game. you need to be available for your team and you're not available when you hit a player in the face and get ejected or sit the bench...but wait. he didn't get ejected. and he didn't sit the bench. so i guess it really wasn't selfish play after all, because he must have known that bill wouldn't have the stones to sit him in a big game. yeah i said it. so then i thought, maybe bill just didn't see the not-quite-a-punch-kind-of-a-shove hit. maybe he didn't know how bad it was. maybe he'll watch the tape later and he'll address this in a press conference later this week. maybe he'll suspend morris for a game. i mean they're facing ISU in their next game, they can afford to teach markieff a lesson in that game. surely he'll take this seriously. there have been too many problems with the morris twins crossing the line from aggression to just flat out losing their tempers for self not to treat this with seriousness. i mean, surely he values his integrity as a coach more than he values beating ISU by 50 points. right? RIGHT? well, if you can't tell, i was typing with a very sarcastic tone there. because bill's only response this week was to say that people shouldn't be worried about it, that it looks worse than it really is (REALLY bill?? can you say that it "looks" worse when it has happened more than once in a season? when it has become a bit of a pattern? can you really say that? ), and that it's being "addressed." then he went on to sing the praises of the morris twins and how much they've matured. eh??? look, i'm fine with the fact that self may not want to put everything out there in the public eye. i guess. and really, i don't have a MAJOR problem with any one specific event, it's more a problem with the cumulative non-addressing of things, the collective ignoring of things, if you will. because i'm watching my team, my coach, frank martin, get blasted for being tough, for being a disciplinarian, and for having players leave his program because they are too poo-poo-pants to cope with having to share the spotlight and not getting enough playing time. so yeah, i have problem with people NOT having a problem with bill self for doing nothing and i have a problem with people HAVING a problem with frank martin doing SOMEthing. i'm not going to make any snap judgments about self because i've respected him for longer than i've not respected him. but, the recent events are a bit of a crimson flag to me. p.s. and by the way, freddy asprilla, what the crumb do you expect to happen to your precious playing time when you played like crap every time you were in the game??? really. p.p.p.s. i would like to congratulate myself for using words like "poo" and "doo" and "crumb" instead of the more passionate language that i would typically use when i'm not self-editing. short term memory...a snow day post! i'm in the midst of enjoying yet another snow day...got to sleep in until 8:15!! that's 2.5 extra hours of sleep people! so far this "blizzard" has more bark than bite, but it is still early i suppose (update: in the time it has taken me to write this post, the little wisps of snow have truly become a blizzard indeed!). i will say that weather.com has pretty much got it wrong all along, i recommend accuweather.com instead. according to weather.com, the snow was supposed to start yesterday morning...oops. posts ago i promised to do a post showing off some new old found things. that promised post then promptly slipped my mind. i have a short term memory problem. i really do. i need to start doing puzzles or something. *mom and i dug around in her basement a little over christmas and pulled out a bunch of her grandmother's china. since she doesn't use it (mom notoriously has about 40 different sets of dishes! ), i brought it home with me... the pieces i'm not using are carefully stored away in china storage bags. there's a whole set of the floral china like the teacup, plus this great fireking bowl (the pink bowl), and a couple of mismatched dessert plates. i've always wanted a little collection of mismatched teacups, but even better than buying a bunch of mismatched cups is getting my great-grandma's teacups for FREE! *so, ever since we moved, i have been trying to remember where in the BLAST i put our silver set that was a gift to kirk from his mother... i know, i know, i'm the most HORRIBLE person to not remember where i stashed the gifted silver! 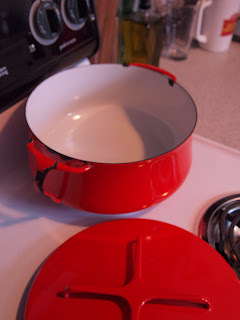 *i love colorful vintage enamelware and have been looking for just the right piece. i like reds and turquoises in my kitchen and i wanted to get a piece that i will actually use because i just DO NOT have room in my tiny kitchen for things i won't use. i'm not really a collect-and-display type of person. things need to have a purpose. well, i do not have a stock pot so i found this dansk enamelware pot for a great price on etsy and the enamel on the inside of the pot was in great shape so i bought it! and i've already used it to make lentil soup! *found this great little creamer to add to my white collection... it's not really a collection, i just have white dishes. the stripe-y pitcher is a gift from my friend, hannah, from france... apparently they use pitchers such as this to serve wine! metal because of the layers of dust...but i cleaned it up and i love it! you all know how i feel about globes. *check accuweather.com for accurate weather forecasts (hence, the name). drawer under the stairs...you never know what treasures you may find. *free stuff is always better than not-free stuff. *when starting a collection, check with your mom who has thousands of dish sets first to see if there are heirloom pieces that she's not using. *only buy vintage pieces that you a) love and b) envision using. unless you like vintage globes. 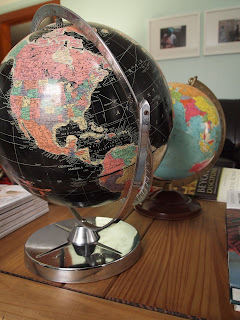 it's ok to buy vintage globes, or get them for free, even if they do not serve a very practical purpose. because they look awesome. and they are cheaper than traveling to exciting places. although traveling to exciting places really is an adventure that cannot be replaced by globes. that's all. p.s. i am having a great deal of difficulty posting pictures today so apologies for the confusing pictures in the wrong places and wonky typing!